Ford Motor Company cut CO2 emissions at its global facilities by 37 percent per vehicle between 2000 and 2012 and plans for a 30 percent reduction from 2010 to 2025 by addressing everything from new products and technologies to manufacturing processes. 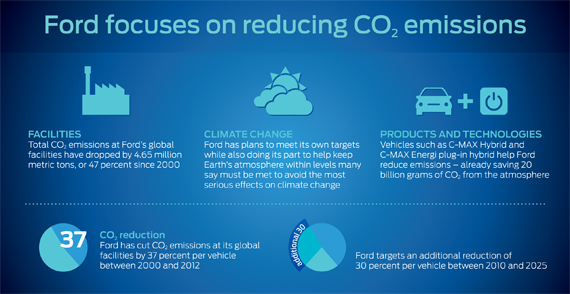 Ford’s work to reduce CO2 emissions is outlined in Ford’s 14th annual Sustainability Report issued today and more importantly, part of the company’s overall mission to facilitate continued reduction of CO2emissions. Already, total CO2 emissions at Fordâ€™s global facilities have dropped by 4.65 million metric tons, or 47 percent since 2000. 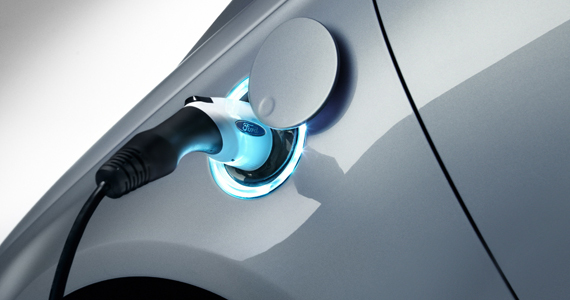 Ford also delivered on its commitment to reduce U.S. facility emissions by 10 percent per vehicle produced between 2002 and 2012, as part of an Alliance of Automobile Manufacturers program. And vehicle tailpipe emissions on a per vehicle basis have dropped 16 percent since 2007 as new vehicles such as Ford C-MAX Energi plug-in hybrid have become available. 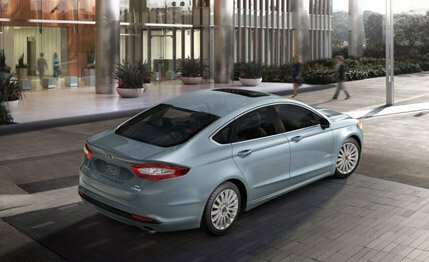 And Ford has even bigger plans to reduce CO2 â€“ one of several priorities outlined in its â€œBlueprint for Sustainability: Our Journey Continues.â€� Other subjects in the voluntary report range from reduced water use and energy consumption to cutting the amount of waste-to-landfill at Ford facilities around the world. Ford Chief Financial Officer Bob Shanks said sustainability issues are embedded in the companyâ€™s business plan, and are consistent with its aim to deliver great products, a strong business and a better world. â€œWe are much more proactive in understanding the importance of sustainability in the broadest sense â€“ not only in relation to our products, but also in the quality of the financial results that we derive from them,â€� said Shanks, whose perspective is featured in this yearâ€™s report. Ford issued its first voluntary sustainability report in 1999 as a way to summarize and report on the companyâ€™s initiatives regarding social, economic and environmental issues. Like Fordâ€™s sustainability-related processes and results, the report has evolved â€“ from a printed booklet similar to an annual report, to being so detailed and comprehensive today that it requires an entire website, which can be found here. In the early 2000s, Fordâ€™s Climate Change Task Force identified a need to address shifting market trends and government regulations â€“ among many other factors â€“ with regard to reducing CO2 emissions. Investors also are increasingly showing greater concern about climate change as a material risk for companies, creating a much stronger link between climate-change-relevant information and initiatives â€“ such as the CO2 Model â€“ and access to capital. â€œBeyond those imperatives, we had taken to heart our responsibility to contribute to meeting the challenge of climate change,â€� says John Viera, global director, sustainability and vehicle environmental matters. Ford has developed products and technologies along with processes at its facilities and plans to meet its own targets while also doing its part to help keep CO2 levels in the Earthâ€™s atmosphere at or below 450 parts per million â€“ a goal many scientists, businesses and governmental agencies say must be met to avoid the most serious effects on climate change. Take Fordâ€™s EcoBoostÂ® engines â€“ now on more than 600,000 Ford Motor Company vehicles â€“ that improve fuel economy and cut CO2. And since sales began of Ford C-MAX Hybrid and Ford C-MAX Energi plug-in hybrid, more than 20 billion grams of CO2 have been saved. 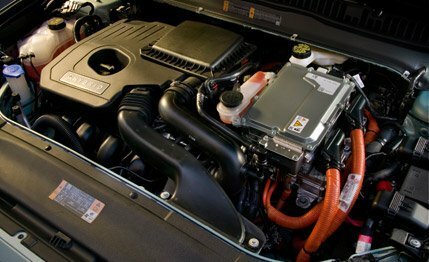 Emissions from C-MAX Energi are less than half the average CO2 that comes from a regular car. At its facilities, Ford is expanding its industry-leading 3-Wet paint capacity by 50 percent this year â€“ adding the environmentally friendly process to four more plants on three continents. Increased use of this process, which streamlines the painting process, is expected to reduce CO2 emissions by up to 25 percent where used. And in the last eight years, company scientists have developed the Ford CO2 Model â€“ a business planning tool that takes into consideration data and regulations from, among others, the International Energy Agency, National Center for Atmospheric Research, U.S. Environmental Protection Agency and the National Highway Traffic Safety Administration. Ford also worked with researchers at Chalmers University in Gothenburg, Sweden, and from companies such as BP in the process of developing the CO2 Model.